1. 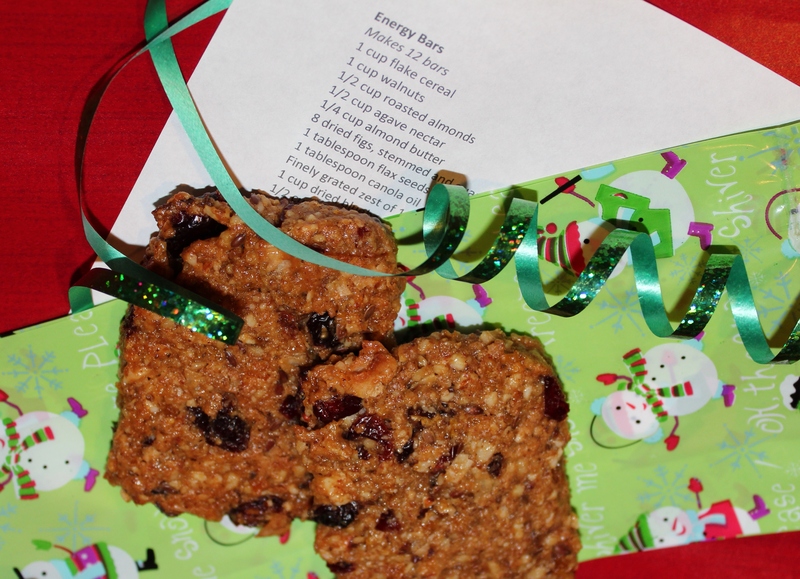 If you have active friends who don’t always have time for breakfast, consider making them a batch of Energy Bars. To make it more festive, replace the walnuts with pecans, use cranberries instead of blueberries and add a 1-2 tablespoons of minced crystalized ginger. Wrap them in a gift bag or plastic container, and attach the recipe with a piece of ribbon. 2. Another much-appreciated gift for busy people is a pre-made or easy-to-freeze meal. 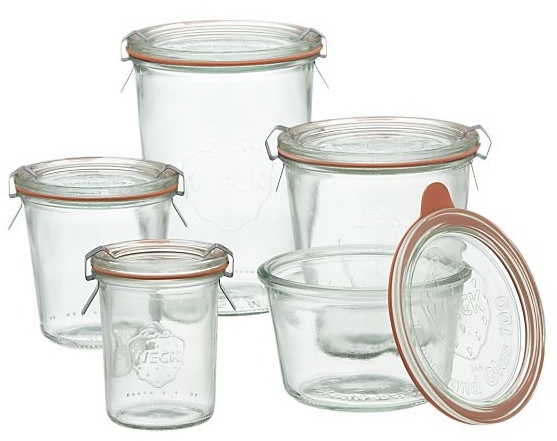 Buy an attractive storage container (Weck canning jars come in several sizes, are quite attractive and can be reused) and fill it with fresh Carrot Ginger Soup, then attach a tag with instructions on reheating it—or freezing it for another day. 3. Another dish that freezes well is Macaroni and Cheese, and it’s always a hit with kids. 4. Also for the youngsters on your list: Make a batch of Crispy Pops—decorated in red and green instead of Halloween colors. 5. Sauces don’t always freeze well, but many can be refrigerated for up to 7-10 days. A jar full of my Salsa Verde, for example, could be packaged with a fancy bag of chips and a nice bowl. 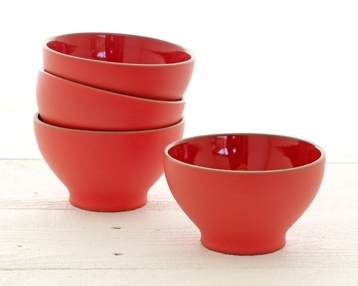 My new favorite dishes are Heath Ceramics, and the company carries several colors and sizes of bowls. 6. If people on your gift list are avid cooks, they might appreciate some new utensils. Consider an Epicurious cutting board, a Microplane or Rosle zester (below), or an 8-inch cast iron pan. Tina’s Tip: Lodge makes a good, basic, cast iron pan. 7. Another kitchen item I couldn’t live without is my Kramer chef knife. Kramer knives are custom-made and cost $2,700-$3,400, but Sur La Table carries Kramer knives made by Shun that are quite good for home cooks. 8. A plate of cookies is always a welcome gift for people who have too much stuff, but not much time for baking. I like Grand Central Bakery’s Oat Ginger Tea Cookies, as well as these Triple Ginger Cookies I just made out of Bon Appetit magazine. 9. A few years ago, I filled a binder with all of my favorite recipes as a gift for my brother. Another time, I bought a cookbook I really enjoyed myself, and I went through it and tagged all the recipes I had tried, wrote in any adjustments I had made, and then gave it to a friend as a thank you gift. You could photocopy pages from your tried-and-true cookbooks, and print out your favorite online recipes (from this blog, for example)—and share them with your friends and family. 10. Or, best of all, give someone the gift of not having to cook for an evening. A Sage Catering gift certificate comes in all different sizes and can be designed to cover a family dinner, a week’s worth of lunches, or a small catered party. Contact me for more information: thymwithsage@gmail.com. This entry was posted in Cooking advice and tagged gifts. Bookmark the permalink.